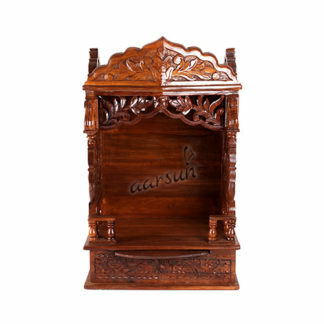 Aarsun Woods presents Wooden Mandir / Pooja Cabinet / Home Temple made in premium quality Teak Wood (Sagwan /Sevan Wood) hand-craved by skilled artisans with traditional walnut color finish. The Top Part consists of 3 Domes: One Larger than the other adjacent two. The Domes are confronted by Beautifully Handcrafted Mehraab with Peacock Design at the center. The Mehraab is extended to the front of the Garbgriha. The center (Garbgriha) consists of four designer pillars with elephants guarding the Temple. The center also consists of a raised platform for placing idols that can be removed as per your need. The base consists of a two panel cabinet & two single panel cabinets with three pull out drawers in front. The Base provides ample space to keep all your pooja essentials at one place. Lighting provision is made inside the temple. 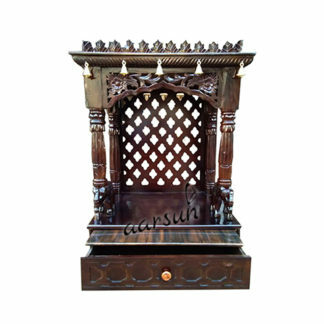 We have a number of designs in Wooden Temples. 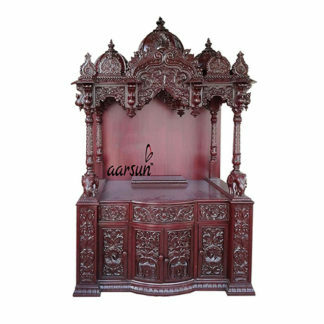 As we are the manufacturers, each Temple can be specifically made as per your home requirements. Please contact us via Amazon Messaging Service by clicking on Sold and Fulfilled by Aarsun Woods and on the following page, click on Contact the Seller at the bottom right corner.